Another event that I entered because of the logo. We travelled to Kent after my Ringwood swim set on Saturday morning & managed to get into our room early so dumped everything in there before doing our reccie of the bike course. Thankfully they had already put the signs out so it was quite easy to follow. After the reccie we still have a little while to wait before registration opened, but once that was done we headed back to our hotel for dinner. We then settled down to catch up on the day’s Tour & saw that G had managed to hold onto the coveted Yellow Jersey. Sunday was another early start – 4:45 alarm call. We then had a 30min drive to the race location. This is the first time that I have done a Trispirit event which was very well organised. The transition area was very clean in that there were no bags, boxes or anything else other than what you needed to race. Not only that, it was clean in that they had swept & raked up all of the long grass cuttings to make it as uncluttered as possible. The swim start time was 7:30am prompt with the race briefing at 7:15. Before my race though, there was the Half Ironman Tri & the Aqua Bikes starting at 7am prompt so the lake was a bit busy when we started, as they had the Half guys & gals swimming through us. The first lap of the swim was OK but there was a bit of an issue on the second lap because the third buoy was floating towards the far end of the lake so that where everyone was heading but the man in the canoe sent us back to go around another boat which the Race Referee had told to go to the buoy’s position. Once I’d gotten around that issue I then headed into T1. 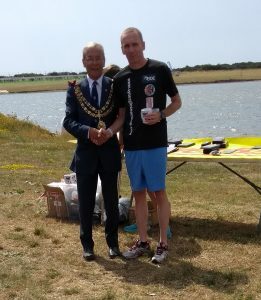 This was an extremely fast transition as there was no wetsuit to take off because the water temperature was a bath-like 24oC (after the event, the Mayor had told Coach 2 that four people had been hauled out of the lake suffering with hypothermia!!!! 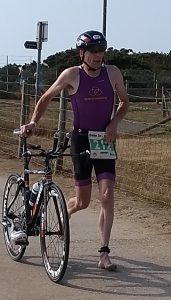 I then headed out onto the one lap, 45K bike course, which can only be described as very bleak, very flat & very fast (if you are a strong biker). Coach 2 had advised that I was in 12th position as I headed off on the bike. I managed to catch some of the people in front of me but most of people I had overtaken were from the Half race. It got a bit lonely at times but I just had to concentrate on the job in hand. Back into T2 via the rutted road (i.e. so many potholes it was more like Paris-Roubaix than Kent country lanes!!). I then headed off onto the two lap 10.5K run course which consisted of tarmac, stony tracks, rutted farmland & smooth(ish) grass tracks. The distance was so that the Half-ers had the correct distance to run. This was the same for the bike. Going back to the run, I struggled a bit on the farmland as it was so hard & dry. 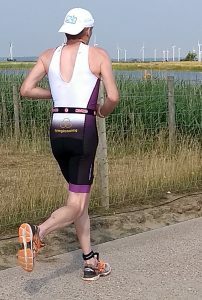 Also, I had no idea of what position I was in but on one of the out & backs, I had four of the quick runners approaching me but only two overtook me & I put in a lot of hard work not to be overtaken by the other two. PS: it was extremely hot & as there were no trees or anything that could offer any shade, after the race we both headed to the First Aid tent, not for treatment but very cheekily asked if we could get some respite from the sun. The guys were very obliging & left us to it. Relief.